I can actually be able to solve the first question, which is about one-to-one. All I have to do is to make them equal to 0, and solve for x, y, z. And give any vector based on relationship I found. For the 2nd question, which is about onto function, I know how to determine if it is onto or not (Just simply use row echelon form and see if its rank isn't 3 since it is about transformation to 3 dimension). 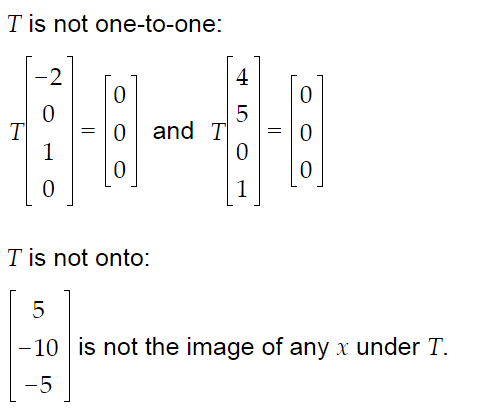 However, I don't know how to get a vector like [5, -10, -5] as shown in its answer image above. I know there are many answers. But I just simply don't know how to get any of those vectors which is not image under T. Could you explain me how to get any vectors that is answer of this question? in the simplest way. Thank you very much if you can help me! Since the rank of the matrix is not full, there will be columns in the row echelon form that will satisfy a linear relation. For example, we have $C_3 = 2C_1$ and $-4 C_1 - 5 C_2 = C_4$. Now, note that both vectors above satisfy $5y - x = 0$ and thus any linear combination of them must satisfy $5y - x = 0$. In order to get a vector that is linearly independent from both vectors, we can take any vector $(x,y,z)^T$ that doesn't satisfy $5y - x = 0$. For example, $(0,1,0)^T$. Showing that the vector space $V$ cannot be generated. How to determine if transform is one-to-one?